Remember when Amazon Prime Video first launched and you logged in, flipped through page after page of obscure movies and ancient TV shows, and, walking away with very little to show for it, looked at your DVD library with far greater respect? 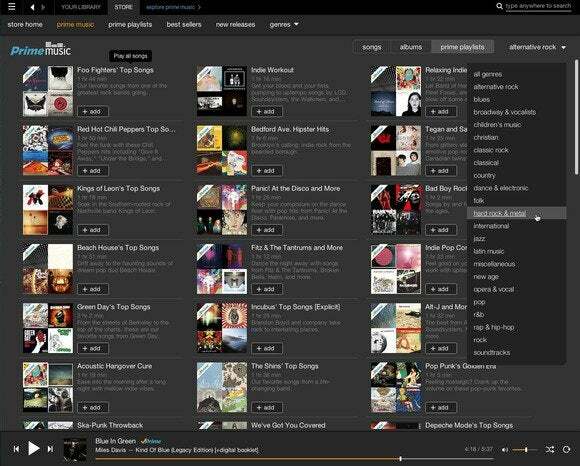 Amazon’s new Prime Music streaming music service may take you back to those bygone days. It’s not so much that its selection is devoid of any good content. After all, who doesn’t love Journey’s Greatest Hits, Daft Punk’s Random Access Memories, and Fleetwood Mac’s anciently ear-wormy Rumours? (I mean, other than me.) It’s just that it’s far from being as comprehensive as services such as Beats Music, Spotify, Rhapsody, and Rdio. How limited is it? To characterize the holes in its 1 million track catalog as anything less than gaping is generous. While Amazon has worked out deals with Warner and Sony to stream portions of their catalogs, Universal Music Group (UMG)—which represents some of today’s most popular artists including Lady Gaga, Kanye West, Lorde, and Eminem—is conspicuous in its absence. The fact that UMG holds a significant share in Beats Music, a company recently bought by Apple, may say something about the likelihood of the label’s future participation in Prime Music. And even catalogs from supported labels are spotty. For example, while Bruce Springsteen is represented heavily in some of Prime Music’s playlists, you won’t find a copy of his one of his more famous albums, Born to Run, among Prime’s offerings. This very limited Miles Davis selection tells you something about jazz and Prime Music. And then there are Prime Music’s playlists. As have other music services, Prime Music has put together collections of genre-based curated playlists. As of this writing, the service has 300 playlists, which you can break down by genre—alternative rock, blues, Broadway & vocalists, children’s music, christian, classic rock, classical, country, dance & electronic, folk, hard rock & metal, international, jazz, Latin music, miscellaneous, new age, opera & vocal, pop, r&b, rap & hip-hop, rock, and soundtracks. By way of comparison, Beats Music has 569 playlists devoted to alternative music alone. There’s lot of artist duplication among Amazon’s playlists. For example, Jimi Hendrix appears in 14 playlists. Green Day is present in eight of them. And Jay Z is represented in 10 playlists. This artist-focused approach is also evident in rock, pop, and alternative playlists, which tend to lean on particular artists. Classical and jazz playlists, however, are centered almost entirely on mood and activity—Jazz for Runners, Rainy Day Jazz, Classical for Reading, and Relaxing Classic Music—thus hinting that they’re best enjoyed when you have more important things to do than listen to music. 300 playlists isn't a bad start for those new to streaming music services. But more is needed to satisfy dedicated music fans. In short, while a million tracks may seem like a lot, when you dig down into Prime Music’s catalog, the offerings start to look a little thin, particularly when compared to the 20 million tracks offered by dedicated music streaming services. All that said, Prime Music’s primary purpose isn’t to compete with these services. Rather, like Amazon Prime Video, it’s offered as another incentive to keep pungling up $99 a year for Amazon Prime (which many people are happy to do simply for the “free” two-day shipping). Music enthusiasts will quickly find its limited catalog wanting, but for the casual listener who’s never bothered with a dedicated service, it may prove to be an eye- (or, more appropriately, ear-) opening experience that sparks an interest in a real music streaming service.